UDM Downloads > CyberMatrix Class Scheduler! CyberMatrix Class Scheduler is a simple to use single or multi-user application that helps students and school administrators to quickly schedule student classes. The software can be used by schools and other institutions that must create class schedules. 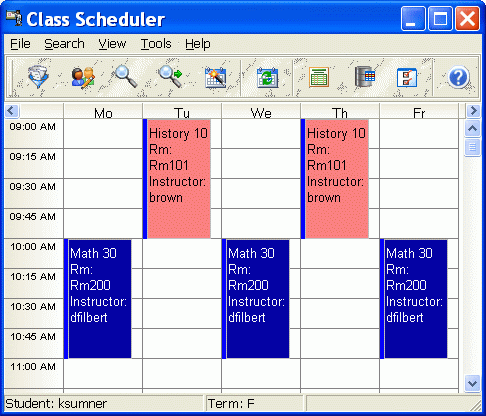 Class Scheduler can be used by a single teacher or by a group of students to schedule classes. The idea behind Class Scheduler is to increase the productivity of classroom administrators by automating the class scheduling process. Class Scheduler features automatic or manual scheduling, bulk scheduling, block scheduling, searching, and support for including other languages. Class Scheduler also has visual scheduling features. Classes can be deleted, added and assigned to different rooms or instructors right from the schedule view. Class times can even be moved around using drag and drop and adjusted by resizing individual classes. The bulk scheduling feature allows you to input a list of all the students along with the classes they require and will then automatically generate all their schedules. The payment and invoicing features help manage the costs associated with classes in private schools, universities and colleges.